Also known as sweetleaf, honeyleaf, and sugarleaf. 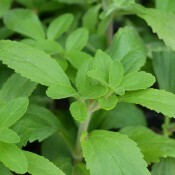 Stevia is a small, sweet herb from Paraguay and Brazil. The leaves have been used for centuries in South and Central America, and other parts of the world as a low-calorie sugar substitute. Stevia is up to 300 times as sweet as sugar. Liquid stevia extract can be made from whole stevia leaves or from the dried stevia powder. Simply combine stevia with pure edible alcohol and leaving it to sit for in a cool spot for 1-2 days. After straining the leaves/powder, the remaining liquid can be cooked on low heat and concentrated into a syrup. Strain into an opaque bottle then store in the refrigerator. Low calorie, fat, and cholesterol. Contains potassium, zinc, magnesium, vitamin B3, and fibre. Leaves may be harvested and used at any time. Cool autumn temperatures tend to intensify the sweetness of the plants. Cut stems with pruning shears then strip the leaves. 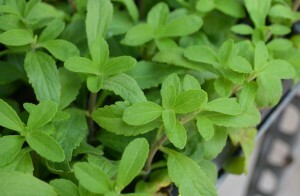 Stevia leaves can be used fresh but should be dehydrated for storage. Any method for drying herbs may be used, such as drying in the sun or in a dehydrator. Dried leaves will keep well for several years if stored in a tightly sealed, air-tight container. Stevia extract (as described above) can be stored in an opaque bottle in the refrigerator for up to 3 months.